The Westminster football squad ends their season with a 28-21 victory over Martin Luther College on Saturday, November 8. 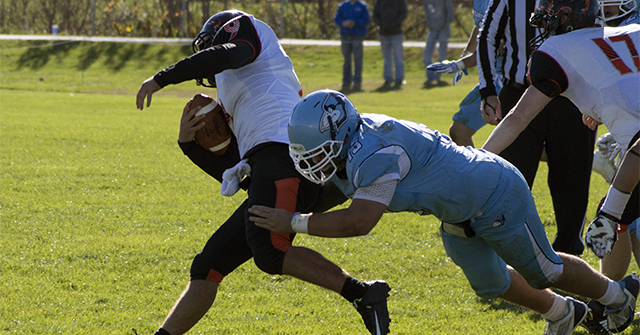 The Westminster Blue Jays end with a 6-4 overall record and a 6-3 Upper Midwest Athletic Conference (UMAC) record. Westminster scored on their second drive of the game off a 12-yard pass from senior quarterback Joe Plassmeyer to junior Austin Kempker. The PAT by junior Kevin Ludwig was good, giving the Blue Jays a 7-0 lead to end the first quarter. Martin Luther started the second quarter with the ball, but on their second play, junior Carlos Weeden Jr. intercepted the pass and returned it 11 yards. The Blue Jays finished the drive with a 1-yard touchdown rush by junior Jantzen Bradford. Ludwig’s PAT was good, putting 7 more on the board for the Blue Jays with 11:23 remaining in the first half. After a penalty by the Blue Jays, Martin Luther started their drive at the Westminster 30-yard line. Martin Luther rushed the ball in the endzone for a touchdown, bringing the score to 14-7. A three-and-out drive for the Blue Jays gave Martin Luther the ball on their own 34-yard line, and they completed a 29-yard pass for a touchdown to tie the game at 14-14 with 3:12 remaining in the half. The Blue Jays received the second half, but were unable to convert to a first down. Martin Luther scored on the following drive, giving them their first lead of the game, 21-14. Martin Luther started the fourth quarter with the ball on their own 31-yard line on 3rd down. The Blue Jays took over on the Martin Luther 40-yard line after Martin Luther fumbled on 4th and 1. The drive was halted by an interception, but the Blue Jay defense held them from getting a first down. The Blue Jays pushed the ball up the field with a series of passes and rushes. A 27-yard pass from Plassmeyer to Kempker gave the Blue Jays their third touchdown of the game. Ludwig’s PAT was good, tying the game at 21-21. The Blue Jays final drive started with 4:12 remaining in the game on their own 32-yard line. A 30-yard pass from Plassmeyer to Kempker gave the Blue Jays a first down, followed by a 14-yard pass to sophomore Mike Washington. Plassmeyer connected again with Washington for a 24-yard touchdown pass with just 1:53 left in the game. Ludwig hit his fourth PAT of the game, putting the Blue Jays up 28-21. Junior CJ Vaughan closed the deal for the Blue Jays with an interception with 44 second remaining in the game. Plassmeyer set the pace for the Blue Jay offense with 271 passing yards on 20 completions and three touchdowns. Washington led with 121 receiving yards and one touchdown on nine receptions, followed by Kempker with 98 yards and two touchdowns on six receptions. Freshman Latif Adams led the running game with 92 yards on 17 carries. Junior Jordan Lauchland led the Blue Jay defense with 11 total tackles. Seniors Levi Powers and Brett Carrigan each registered 9 total tackles. Powers had 1.5 sacks for 9 yards and a forced fumble, and Carrigan has .5 sacks and a pass break up.